Seafires Mk. IB onboard HMS Furious sailing as part of Force H off Algiers in support of Operation Torch, 8 November 1942. 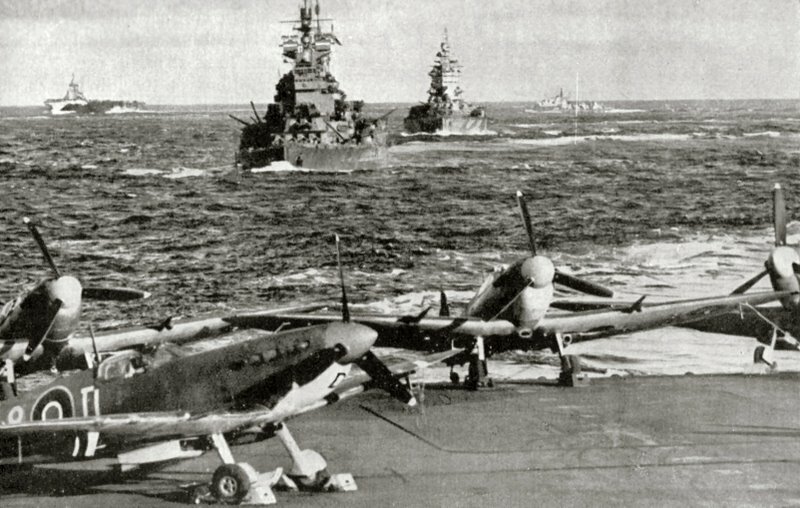 Operation Torch was a combat debut of the carrier-borne Spitfire sibling, the Seafire. In support of the Center and Easter Task Forces were three large Royal Navy carriers, HMS Furious, HMS Victorious and HMS Formidable. Onboard HMS Furious were two large Seafire units, No. 801 Suadron FAA with Seafires Mk. IB (shown) and No. 807 operating Seafires Mk. IIC. Additionally, Nos. 884 and 885 Squadrons, each with six Mk. IICs were operating from HMS Victorious and HMS Formidable respectively. Unfortunately, Opeartion Torch confirmed the initial reputation of the Seafire as a bad naval fighter. The first Seafires were just straight adaptions of the Spitfires Mk. V airframe with added arrester hooks and catapult spools, and the airframe was not structurally strong enough for carrier operations. HMS Furious alone lost 12 aircraft during three days of fighting near Oran, most of them to deck accidents. The other carrier visible in the distance is believed to be HMS Victorious. Readers are invited to help with identification of the other Force H ships visible at this photograph. The ship immediately astern of HMS Furious is most likely to be the KGV Class battlship HMS Duke of York. The second battleship is one of the Nelson class (triple turrets). According to Burt:British Battleships 1919-1939, HMS Nelson was attached to Force H during ‘Torch’, and the camouflage pattern seems to confirm this.